Trip to Truro is a dance that originates from the dancing masters, in this case “24 Country Dances for 1765” by Johnson, page 67. 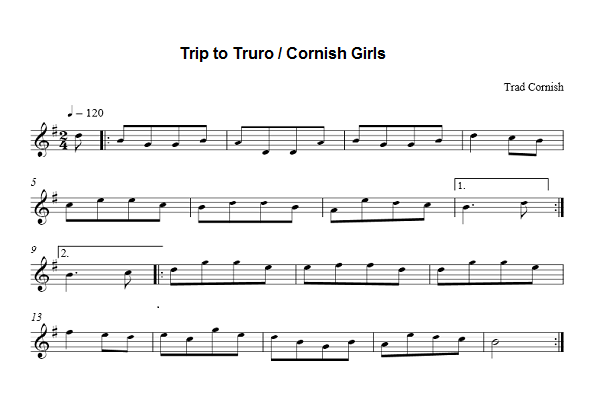 Its early provenance in Cornwall as a dance is not known but the tune is traditional to Cornwall as a song, "The Cornish Girls". A1 All right hand turn partners then Couple 1 cast down to bottom of set followed by Couple 2 (who lead up and cast down below Couple 1). B1 Couples 1 and 2 lead up to places, all set right and left then Couple 1 cast to second place (cu 2 moving up). A2 Couples 1 and 2 square hey giving hands. B2 Couples 1 and 3 square hey for 3 changes (so that couples 1 and 3 change places then 2 hand turn partners). Longways duple minor set. A1 All right hand turn partners then Couple 1 cast down the outside of the set followed by Couple 2 (who lead up and cast down below Couple 1). B1 Couples 1 and 2 lead up to places, all set right and left and then Couple 1 cast to second place (couple 2 moving up). A2 Couple 1 with the Couple 2 above them square hey right round (starting facing partners and passing right shoulders). B2 Couple 1 with the Couple 2 below them square hey right round.